I changed the light bulb in my TV! Yes, I did. All by myself. I used tools and everything. Well…a screwdriver. Which is a tool. One tool. Ooh, and I used a box cutter to open the box, so we’ll stick with tools, plural. And it was quite difficult, you should be very impressed. Actually, it was super easy, but you should still be impressed, because you didn’t even know TVs had light bulbs, did you? Well, they do. Ok, some do. Including mine. Many years ago (let’s say 8 or 9 but probably not 10), my then husband and I bought a BIG, HUGE, SHINY NEW TV. And we got a DLP (which stands for Digital Light Processing, which is interesting, because I thought it was Digital Light Projector so we see how much I know, which is almost nothing) TV. One of the reasons we chose DLP instead of a flat screen is because they told us the TV could last forever, theoretically, and would just need to have the bulb inside replaced from time to time. And I was pretty sure I would be able to change it by myself because Mike (my ex) did it at one point back when he still lived with the TV, which is not a knock on him at all, just that I remember him saying it was ridiculously easy. Recently it seemed that the TV was getting dim. Nothing drastic, but I’ve been binge watching The West Wing again (omigod it’s. so. good.) and I realized that all of the episodes looked like they were full of secret meetings in the middle of the night in dark locations. And I sort of remembered that was a warning sign before the bulb went out the first time, many years ago. Almost six years seemed like a good long time, and that it was time to be proactive and replace it. I wasn’t even sure I would be able to find one easily, and I expected any store I went into to try to sell me a new TV. The bulb is not inexpensive. TVs have come way down in price. Mine is no longer huge by today’s standards. However, my living room is cozy (we don’t want to offend it by calling it small) and frankly a bigger TV would look ridiculous in here. Plus, there’s nothing wrong with it. I like it. It’s HD, widescreen, I know how it works, and it works just fine. I don’t like that the world is disposable and that when what I really need is a new battery for my phone the system is designed just to replace the phone. So I was prepared to dig in my heels and insist on just a new bulb. Imagine my delight when I walked into the store where I bought the TV lo those many years ago and the guy in the TV department said nothing at all about “upgrading” but just walked me over to the service department so they could get the replacement bulb for me. So I got the bulb, I sat down with the manual (perhaps the most astonishing part of this episode was that I found the manual so easily, although unbeknownst to me the bulb included instructions), and I changed that bulb. My favorite part was that it instructed me to wear clean, lint-free, soft gloves. 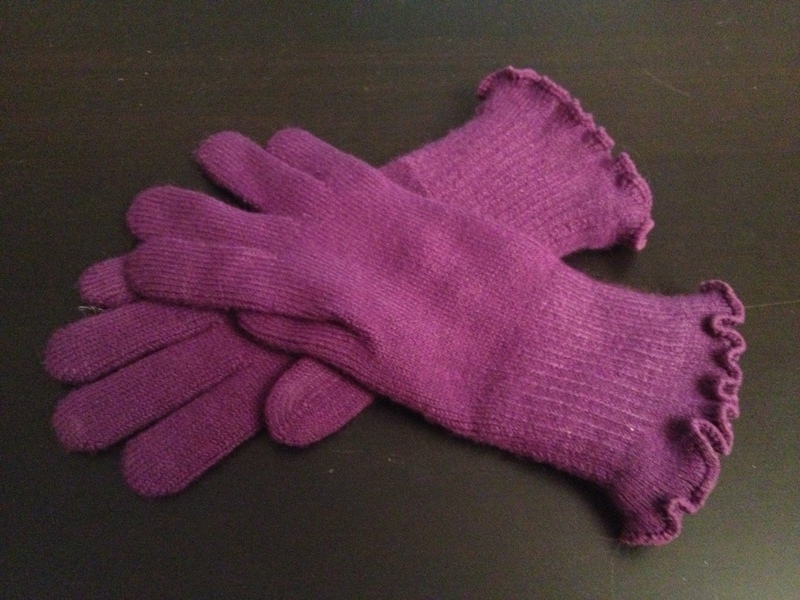 Which led to a discovery of a pair of really cute purple gloves that I think might have been a present from someone, possibly my grandmother, possibly someone else. They were soft and clean and lint-free, so I put them on when I put the bulb in the TV. Well done, gloves! And now I will start wearing you for real, too, sorry I forgot about you! I almost forgot an important step in the bulb-changing process: plug the TV back in when finished. That would have been crushing, for the TV not to come back on. But I remembered, and it DID, and good gravy, it’s bright and colorful and beautiful! And I can see the faces of the people on The West Wing again – woo hoo! Speaking of The West Wing (again), it is so much better than anything on TV right now, including The Newsroom which is Aaron Sorkin’s current show on HBO. But we can talk about it more when I’m finished. Don’t hold your breath for that. Staycation will be over soon and I won’t be able to watch TV all day long. But I will be done with season three by Monday, because that’s when the DVD needs to be back at the library. And now, I will go back to enjoying my glorious, vibrant picture. Oh, and see, aren’t these gloves pretty?